The Nebraska Envirothon is a competition designed for high school students (9-12th grades) to test their knowledge about the environment. Five-member teams compete on the regional level in seven areas of environmental studies: soil, aquatics, forestry, policy, wildlife, range, and current issues. For the state competition, an oral presentation, on a topic selected by the Canon Envirothon Committee, is added to the testing stations. Why take the time to organize and coach a team for this competition? More and more careers are being created that deal with the environment. This is an excellent opportunity to give your students some additional background in the environment and exposure to environmental careers. What makes the Envirothon different from other extra-curricular activities students already participate in? The Nebraska Envirothon competition gives your students the opportunity to take what they have learned in the classroom and apply it to life. Students are given the chance to interact with resource professionals that use the knowledge they gained in high school and college every day in their careers. The Envirothon shows students the link between academics and the business world. Range Judging is a high school competition that challenges students to gain a better understanding of Nebraska rangelands which make up half of the state’s land area. Range judging enables each participant to learn how to recognize range plants, range sites and the need for proper grazing practices. Land Judging is a high school competition that challenges students to gain a better understanding of soil structure and land evaluation. Land judging enables each participant to learn how to recognize the physical features of the soil, determine land capability for crop production, and evaluate management practices needed for proper stewardship. Soil, land, and homesite evaluation provide a setting for students to investigate the soils in their region, the environment that surrounds them and their effect on their daily lives. NRDs work with area schools to host Land Judging contests all over the state each fall. Regional winners go on to compete at the state contest. 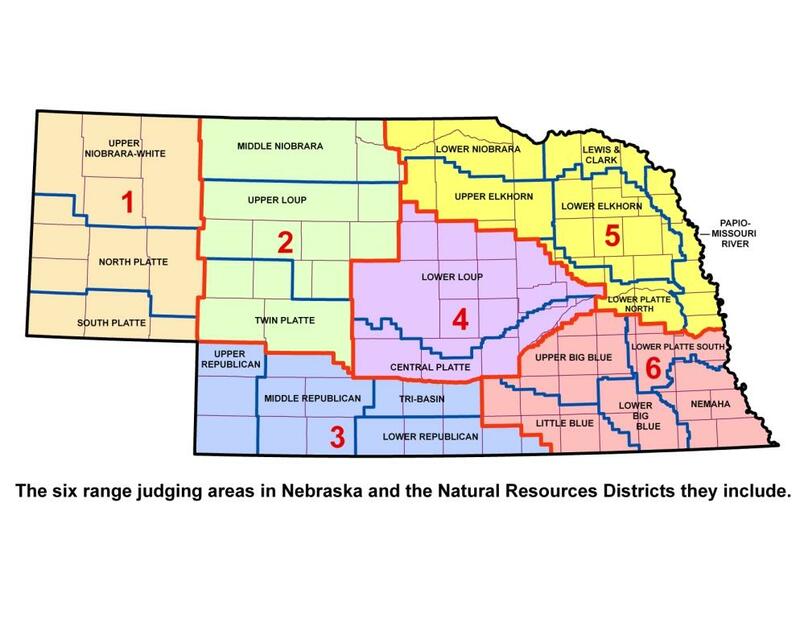 Information, dates and other resources are available on the Nebraska Land Judging website.